(P)(C) 199? Mobile Fidelity Sound Lab, Inc.
... In the process, moreover, Mingus has also developed his own piano style; and judging from these performances, it is through the piano that Mingus is best able to express the more gentle, the more reflective and - I use the word with care - the more innocent elements of his personality. 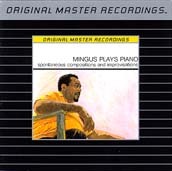 Another Mingus interpretation of Eubie Blake's 'Memories Of You' can be heard on East Coasting.